On Friday 18th September I travelled to the University of Huddersfield to attend the Maternal Mental Health Conference. The audience was mainly made up of midwives, student midwives and people like myself who are interested in maternal mental health. I currently volunteer on the PANDAS helpline and thought it would be a great opportunity to widen my knowledge of perinatal mental health and how it is approached from a healthcare professional’s point of view. I felt a bit odd writing this on Monday after binging on Michelin Star food at Arbutus and booze a plenty for my final blast of 30th birthday celebrations, so I’ve been mentally tracking things as this week has ticked by, and now I’m ready to write. I’m getting married on 12th December. I’ve come through PND, a big fat break up, meeting the love of my life, dealing with ongoing mental health problems to end up here, squeezing into my size 16 clothes and enormous black comfy pants. Oh dear. As each Monday drifts by in a haze of “I definitely deserve this bottle of wine after today!” and “Darling, let’s treat ourselves to an Indian..” the pressure is kind of mounting now. The fact is, I don’t want to look like the Michelin Man on the school run, let alone on our Big Day SO it’s time to “cut the fat”. Before I begin, I want to make it clear, this blog is not another ‘Mum blog’, there’s plenty of decent ones out there and it’s not my style. We all know the trials and tribulations of parenting, the funny stories (my son threw his dirty nappy across the room last week) and the tough days that almost leave us mentally scarred and grabbing for the wine. This post, is for me to discuss my experience in the first days and weeks after giving birth and how in my opinion, more needs to be done to prepare women for the emotional and mental difficulties many new mums experience when they’ve had a baby. I really feel we could do more. Looking back to my pregnancy, I can’t recall ever discussing the emotional and mental turmoil you can experience after giving birth. My pregnancy was a consultant led pregnancy as I’m a haemophilia carrier, so all attention was focussed around the implications for my baby, should he be a sufferer and the birth plan, as I had elected for a caesarean section for medical reasons. I can recall being around 6 months pregnant and having a conversation with a friend of mine who has 2 children, she asked if I was nervous about the mental health side of things once I became a mum. In my naivety, I told her I’d given it no thought and knew I would be OK because I’ve had anxiety etc. before so would know how to deal with it. I was so wrong, so ignorant and so naïve. My pregnancy had been relatively easy, aside from some SPD pain and worrying about the potential haemophilia status, it was in no way as bad as it could have been. I was even looking forward to the caesarean section, I knew the day my baby would be born and had heard some very positive stories regarding C-sections. 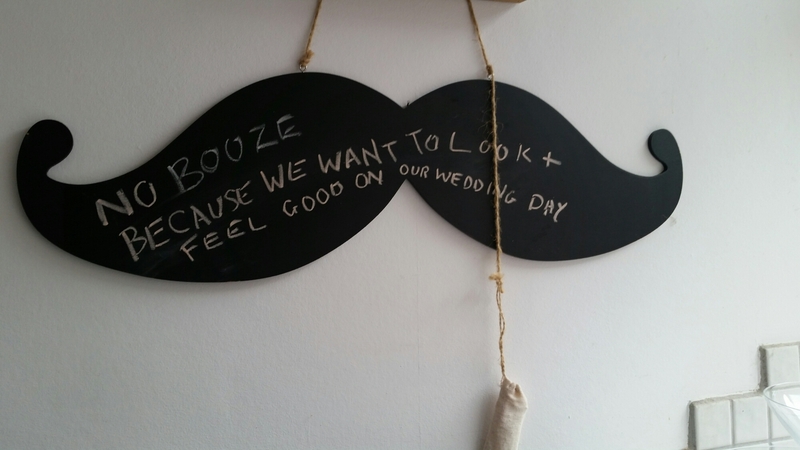 We have a comical moustache shaped chalkboard in our kitchen. Someone gave it to R at Christmas and for some reason it’s become our alcohol pledge board. We were hit side and front on by something that would affect all three kiddliewinks at the start of the year, so we thought we’d stop drinking. I drunkenly scrawled a cryptic message upon the ‘tache, “No booze for good reason” and we launched into a three week dry spell, spurred on by this odd message. Over time, the board has been vandalised and twisted. Up until five minutes ago, the board read: “Booze for many good reasons”. With a chubby palm, I have erased this leaving the following message scribed into a dusty cloud, “No booze because we want to look and feel good on our wedding day.” And that’s that. The thing is, we drink too much. And more harrowingly, I drink too much. R is a happy companion, but I know he’d be just as happy with a cuppa whereas my heartbeat raises every time an empty bottle clunks its way into the recycling bin. Thanks to ‘Time Hop’ my life is now riddled with odd jolts back to my PND infested world. I don’t even have the app, but members of my family do and often send videos and pictures over to our shared WhatsApp group of my daughter when she was tiny. They’re fun to watch, and my little girl loves seeing her little chubby face blowing raspberries or dribbling porridge down her chin. I laugh with her, because it’s funny, but also because it’s like watching these things for the very first time. Thank you so much for writing such an honest and inspiring piece for us. Looking back, do you think your husband may also have been suffering from postnatal depression? While my husband undoubtedly had a hard time of my pregnancies, and the first few weeks of parenthood, I sometimes worry that most of his anxieties were caused by me. He remembers dreading coming home from work because he never knew how he’d find me, and I will always feel a sense of responsibility for those ‘ruined’ few weeks. Even now I think he gets a hard time of it, although we communicate so much more than I was able to in the beginning. That has certainly helped! Did you ever speak to your midwife about your feelings of anxiety during pregnancy? I remember having numerous conversations with our midwife during my first pregnancy, and it was her who referred me for help and introduced me to the counselling I went on to have. The second time around I saw two or three different midwives, and that dialogue became harder to open. I felt as though I was having to explain everything over and over again, even though I wasn’t really sure I could put my finger on what I wanted to say. I found the health visitor invaluable the second time round. Do you feel that there should be more help and support for those suffering from antenatal depression and/or anxiety? Certainly – even now postnatal anxiety and depression are seen as something of a taboo, and I know that I’ve certainly not been forthcoming in talking about it. You’re never quite sure how people will react. Until I suffered myself, I wasn’t even aware that antenatal depression and anxiety was possible. Surely pregnancy is a joyous time? That myth can lead to women feeling isolated, as they’re sure they’re not supposed to feel like that. Support at these points is absolutely vital to stop anxiety escalating. I like that you’ve written “You are not postnatal depression”, but how did you learn to disassociate yourself from your illness? It’s hard, because sometimes it becomes an excuse – I’ve had a bad day, but that’s okay because I have an illness. I think, for me, the most important thing was to not consider postnatal anxiety to be an illness, and also to focus on my children. I was determined that they shouldn’t suffer because I was having a bad day, and just thinking about how they might feel is a great way to pull myself back sometimes. ‘It’ just happens to be something hovering in the background, but it isn’t the heart and soul of who I am. Every day I wake up with a mantra – today will be a good day. Sometimes I’m confident enough to pull that off! I too have struggled to come off medication, do you still have hope that one day it will be a possibility for you? Oh yes. I was prescribed medication when my first son was still very small and decided early on that it wasn’t for me. I stopped taking it altogether and found I was able to control my anxieties on my own. The second time around has been harder – a little more of a roller coaster as I attempted to understand what would work for me. I didn’t want pills to control me, but I’ve learned to accept that they’re not altering who I am, merely how I cope under certain strains. I know that one day I’ll be able to control my own emotions, so I have no doubt that this is just a temporary solution. What do you do during your dark days to try and lift yourself out of them? I leave the house. I can usually tell quite quickly what sort of day I’ve woken up to, and so if I start to feel a little low we’ll head out to the park, or I’ll contact friends to try and arrange something. As long as the children are up and active, and enjoying their day, I think it’s okay if I’m having a bad day – their happiness is one of the best feelings in the world, and it’s infectious. Staying at home tends to be a trigger for anxiety, as I’ll feel guilty if I’m not up to doing much. And finally, do you have a message for anyone who has not yet seen the light? Just that it is there – honestly! Antenatal and postnatal anxiety and depression are so cruel, bringing you down when you should be on Cloud 9. The tiredness and range of new hormones and emotions never helps, but you need to understand that this isn’t going to be forever, and it’s okay to have dark days. They just make the good days seem all the more brighter. Don’t ever be afraid to ask for help either – telling yourself that you’re suffering is one thing, but being able to admit that is a huge step forward. Hello there! I’m Catherine. I’m the (wobbly) braun behind the PANDAS Guest Blog. It’s been suggested by our team that it would be interesting to have a regular feature, the tale of someone who’s been there, done that… and I volunteered! I’m 30. I live in a town called Rugby. I play the cello and cross-stitch for money. I have a daughter, V, who is 2 years and 8 months old. I live with my fiance R. R has two children. L is 7 and M is 4 (nearly 5). L and M live with us part-time, 50/50. The rest of the time they live with their Mum who lives down the road. V’s Dad lives in a town called Tarlac with his wife and son, and we haven’t heard from him since January.